SYNOPSIS: Some summers are just destined to be pretty. REVIEW: Let me be upfront about it. I didn't like this book. I didn't like it so much but I'm not saying I didn't like it at all. I'm going to make this review as short as possible because if I do otherwise I might end up ranting rather than "reviewing." 1) Belly herself. I wasn't drawn to her character right off the bat - and I think it's safe to say that the protagonist has to be charming on some level early on. I felt like she was immature (though 15 is kind of like a kid, still) and quite frankly shallow. The book mostly revolved around her so called love for Conrad, one of the brothers, and her other petty problems essentially leading back to her frustrated attempts at getting Conrad. It took me a while (and I mean towards the end of the book) for me to feel even a little bit of appreciation for her. Add that to the fact that it was revealed very late in the book that her real name is actually Isabel. The whole time I felt annoyed that her name's Belly. It's a cute nickname and all but it's just a bit... meh. It's more than just the name. I felt like along with the late reveal, her "spark" came late too. It's like I had to wait for the conflict (the real one, I wouldn't spoil it though) to arise before I even sympathized with her. 2) Character development. To me some of the characters were a bit raw. I didn't see how they were assets to the story. LIke Steven, Belly's brother. At some point I thought it wouldn't make a difference if he weren't there at all. I think some of the characters weren't developed enough in as much as others were overdeveloped (if that's even possible). 3) Chapter switching. 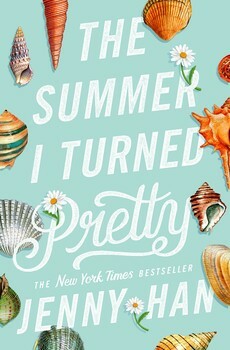 I think it was a nice idea for Jenny Han to write the book in such a way that some chapters were flashbacks of Belly's past summers at Cousins Beach. But in the beginning, I found it very confusing and it really took a few chapters for me to get used to it. It's good that she provided back stories of chapters written in the present however, some chapters seemed a little off - like it wasn't relevant or it was ended too abruptly. 4) The climax. This came in too late in the book just like Belly's "spark." But I guess Han meant well because the ending was supposed to set the mood for the 2nd book, I reckon. Still, I felt like the whole time I was reading the book, the story was just going and going and going and... at one point I wondered how the story would land. Heck it didn't even take off! It was like an airplane taxing endlessly. Probably the only redeeming factor for me was the ending - the conflict itself. It made me want to read the next book. And somehow it gave depth to the story, in the real sense not just in the she-wrote-a-big-problem-that-deepened-the story way. But like I said, everything just came too late.